Protect yourself from the potential liabilities associated with not properly destroying your confidential materials or expired/ defective products. We offer various services ensuring that waste items designated for destruction will no longer be able to be utilized. Whether confidential documents, electronic media, or expired/defective products, we have the right solutions for total destruction! 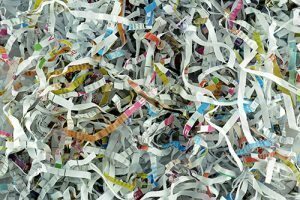 We offer both the shredding and incineration of confidential documents and various media, which allows you to choose the ultimate destruction method that best suits your needs. Both methods are sustainable means of managing your waste that is designated for destruction. Shredded documents are recycled into new paper, and incinerated documents are turned into energy at waste-to-energy facilities. A major concern of many companies is the data security of the various electronics being recycled. We are able to offer degaussing of tape and disk media. This is the process of changing the magnetic domain of where data is stored. This basically scrambles the data and makes it unreadable. Utilizing the proper degaussing process will ensure that the data on the media can no longer be retrieved. We then recycle these media for a beneficial reuse. We recognize the potential liability caused by a defective product and the need for assured disposal. We offer assured product destruction to ensure your defective materials are properly disposed. We are highly qualified and experienced in handling sensitive waste streams and making certain that materials are destroyed completely via incineration. With both our confidential document destruction services and our product destruction services, we will provide tracking from the time of pick-up to the point of destruction. We also offer witnessed incineration of materials for highly sensitive waste streams. We have provided assured destruction services to both the private sector as well as government facilities. Once materials are destroyed, we provide a certificate of destruction and a weight ticket to demonstrate the completed destruction. Call us today to discuss your destruction service needs! Whether confidential documents, electronic media, or expired/defective products,we have the right solutions for total destruction!! We recognize the potential liability caused by a defective product and the need for assured disposal. We offer assured product destruction to ensure your defective materials are properly disposed. We are highly qualified and experienced in handling sensitive waste streams and making certain that materials are destroyed completely via incineration. We will provide tracking from the time of pick-up to the point of destruction. ASI Waste offers witnessed incineration of materials for highly sensitive waste streams. We have provided assured product destruction services to both the private sector as well as government facilities. Once materials are destroyed, we provide a certificate of destruction and a weight ticket to demonstrate the completed destruction.